Secure Window Roller Shutters is your go-to producer and installer of modern window shutters. Effective, highly secure and stylish, our modern roller shutters are the best option for keeping your Melbourne home protected from the elements as well as intruders. As a roller shutters company who provide a state of the art product for an amazing price, we have earned a reputation with our beloved customers for providing an outstanding service across the board. Installing window shutters at your Melbourne or Geelong home comes with a huge range of benefits, and Secure Window Roller Shutters is the best in the business. Contact our friendly team to arrange a free, obligation-free quote or pop into our St Albans/Kealba Show room/Factory at 2 Malcolm Court to learn more about our amazing product. Protection from Intruders: We produce a range of roller shutters for Melbourne and Geelong homes which protect the home from unwanted intruders. You can keep your roller shutters down throughout the day, ensuring that any criminal who targets your home will have no chance of breaking in through any glass doors/windows. Long-Lasting: We proudly produce incredibly long-lasting modern window shutters for Melbourne homes. This makes them a great investment for you and your family, as you will have long-lasting protection from the elements and intruders. Style: The stylish aesthetic of the designs produced by Secure Window Roller Shutters are sure to wow friends and family, as well as add extra value to your property should you ever choose to sell. Fire Protection: Some of the range of modern window shutters produced by our team contain properties that can help protect your home from bushfires. We have a range of Firesafe Bushfire Rated Roller Shutters necessary for the ever-increasing importance of protection from bushfires. *Must purchase minimum of 3 shutters No further discount applies. Why Choose Our Team for Your Rollers? 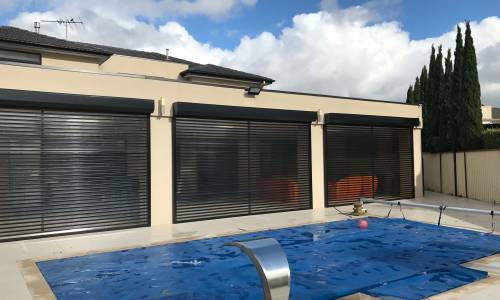 Secure Window Roller Shutters has long been one of Melbourne’s most trusted names in the production and installation of roller shutters. We understand you reasons for wanting to have this product installed at your home or business, and therefore work very hard to produce a specialised product with each job we undertake. Our team of highly skilled and experienced technicians have a profound understanding of the various dynamics and specifications of different homes and commercial properties, and can produce your roller shutters to fit these dynamics. Furthermore, they are consistently being trained and updated in new technology to ensure we are ahead of the curb when it comes to producing a quality product. We care greatly about the safety and energy saving capabilities of your property, and our friendly team of experts will do everything necessary to ensure that our product meets your requirements. We are constantly receiving praise from happy clients who tell us that they couldn’t be happier with the standard of product produced by our experts. Would you like to get started with having modern roller shutters installed at your Melbourne home or commercial property? If so, feel free to get in contact with the friendly team of experts at Secure Window Roller Shutters. We are dedicated to providing our valued customers with an exceptional standard of service and communication, and will be happy to answer any questions you have regarding our product or book you in for a quote at a time that is most suitable for you. Give us a call on 1800 554 877 or submit an enquiry form on our contact page. We will get back to you as soon as possible and with all the information you require.